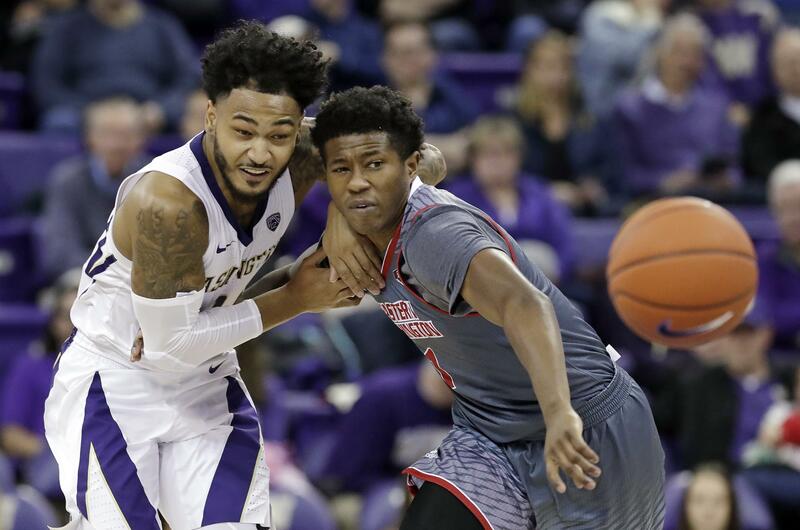 SEATTLE – Dominic Green hit seven 3-pointers and scored a career-high 25 points, David Crisp added 14 points and Washington cruised past Eastern Washington 83-59 in nonconference men’s basketball on Tuesday night. After taking two of three games during the Vancouver Shootout last week, the Huskies (5-2) opened a relatively quiet week with a romp against an in-state opponent. Washington made it look easy thanks largely to its 3-point shooting, with Green leading the way. The Huskies made 12 of 28 3-pointers. Green was 7 of 10 on 3s, finishing two off the school record of nine 3s set by Ryan Appleby in February 2008 against Oregon State. Green’s previous high was six 3-pointers last season against Bethune-Cookman. Jesse Hunt led Eastern Washington (1-4) with 15 points, but the Eagles didn’t have any answers for Washington’s hot shooting. Hunt has scored in double figures in three straight games. Eastern, which hadn’t played since Nov. 17 when it beat Missouri-Kansas City 87-80 in Cheney, used an 11-0 run, with two 3-pointers by Cody Benzel and another by Jacob Davison, to cut the lead to seven in the first half and 35-25 at halftime. But Washington went on a 12-0 run in the second half, putting the Huskies up by 24 and putting the game away. Washington led by as many as 27 late in the game and had a 26-2 advantage in fast-break points. Washington came out of its three games in Vancouver, British Columbia, last week in search for more consistent shooting and ultimately a third scorer to complement Jaylen Nowell and Noah Dickerson. Green could end up being one of those scoring options if he becomes less streaky with his 3-point shot. Washington led by as many as 18 in the first half and 27 late in the second. Published: Nov. 27, 2018, 8:14 p.m. Updated: Nov. 27, 2018, 10:32 p.m.